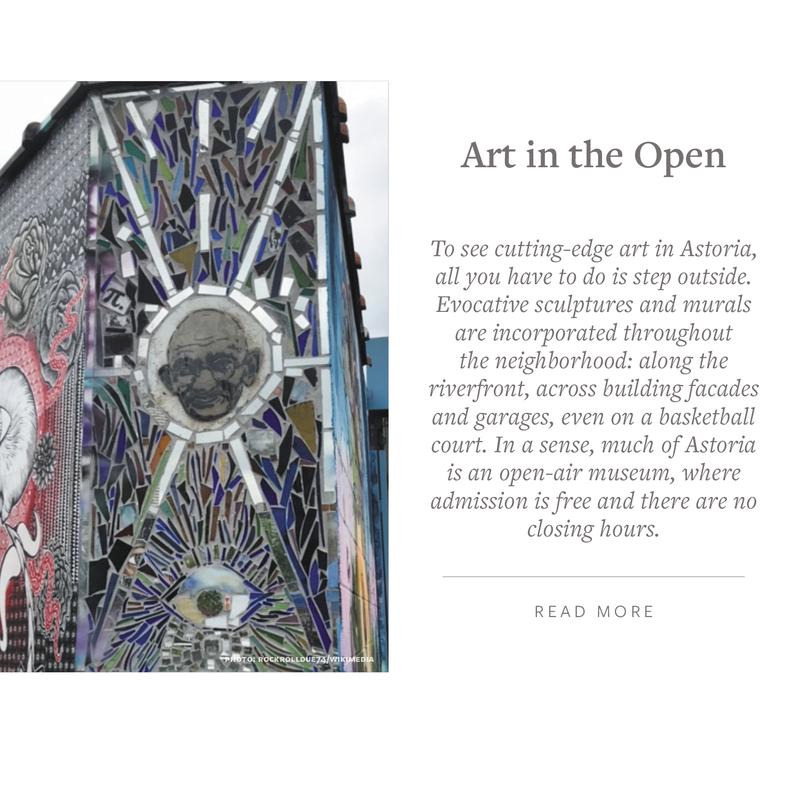 This month’s edition of Culturally Inclined focuses on Astoria, located across the East River at the northern tip of Queens. 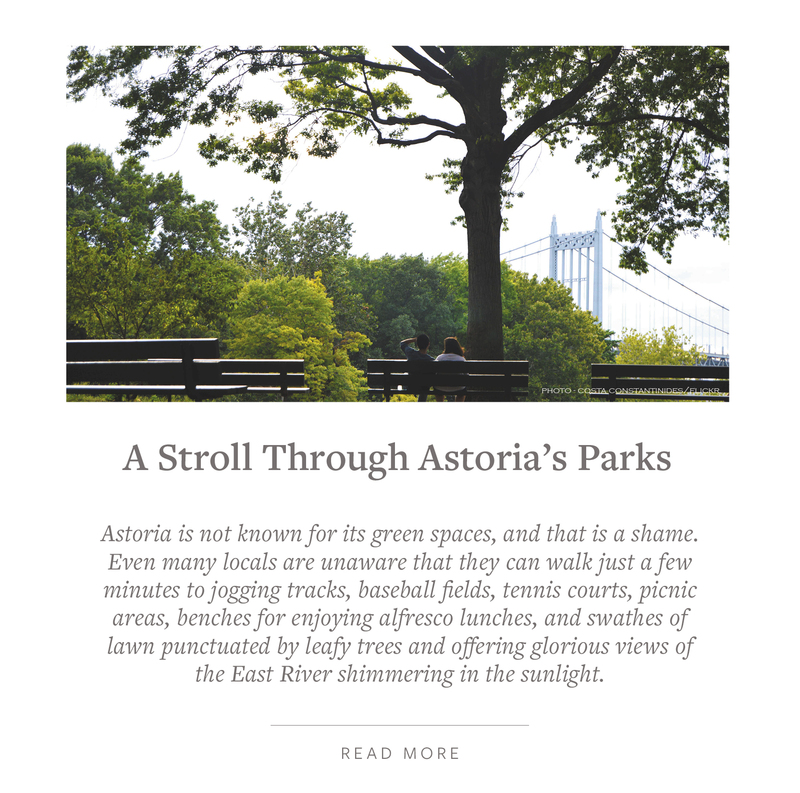 Astoria, a community whose boundaries are constantly changing and debated throughout history. There are three distinct neighborhoods: Ravenswood, Ditmas and Astoria Heights. An Astoria landmark, the Riker-Lent Homestead built in 1655 by Abraham Riker Nieuw, Nederland’s last governor, Peter Stuyvesant, is the oldest remaining dwelling in New York City still used as a residence. Old Astoria Neighborhood Association captures the architecture glory of Old Astoria. And, in 2012, Rafael Herrin-Ferri artist/architect began systematically photographing the houses of Queens and has captured the variety of housing tracts in Astoria. 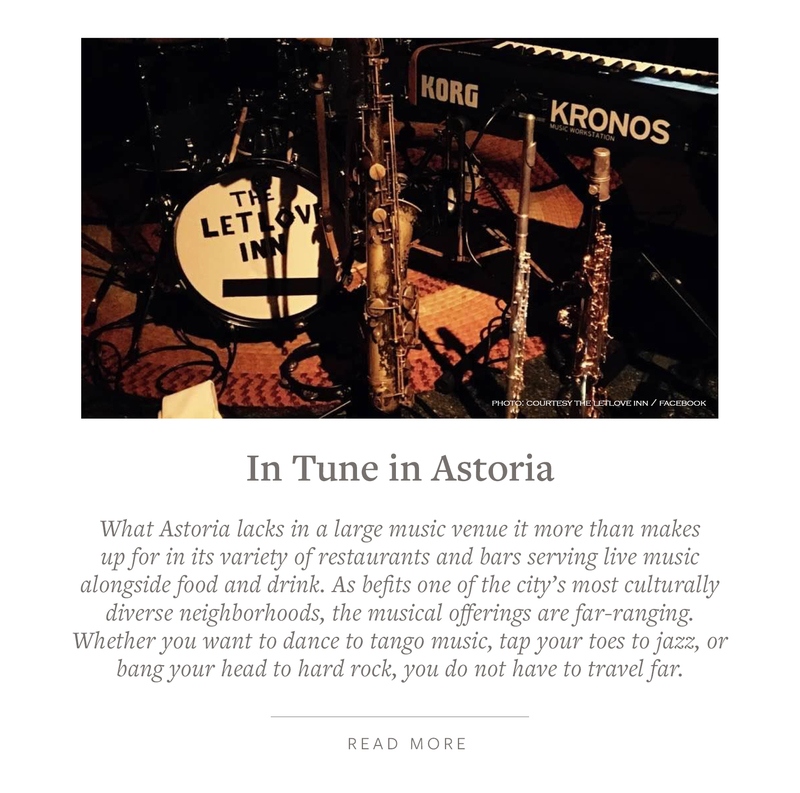 “Astoria is among the most gentrified neighborhoods in Queens and is constantly updating its housing stock leading to many jarring juxtapositions both in scale and building styles”. 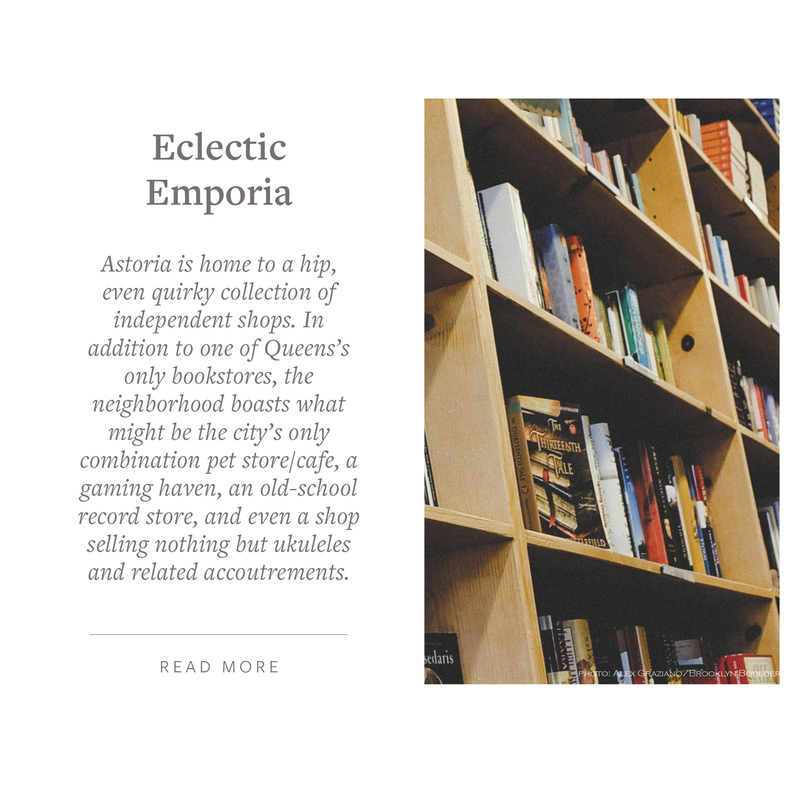 Astoria has a large warehouse district and hodgepodge of architectural styles. Rafael Herrin-Ferri attributes this to: “When so many people from so many cultures with so many different aesthetic preferences co-exist in a tight urban fabric it seems only natural that the streetscape should look like this. For me, these houses represent an “urbanism of tolerance” and to shifting gridded street patterns and topography. 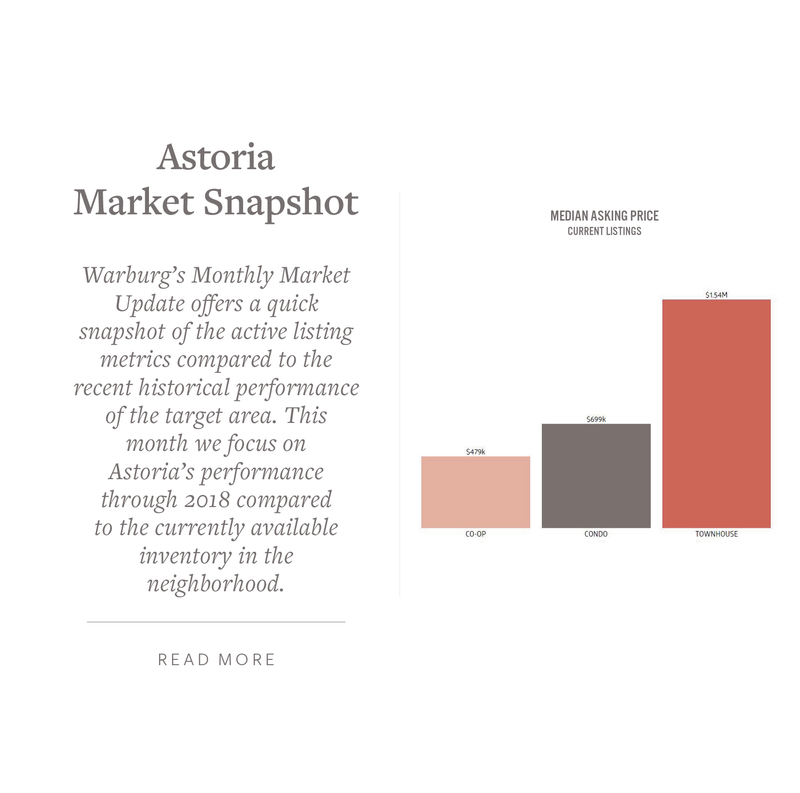 Astorians are experiencing a real estate expansion and many new buildings are rising on the waterfront and in the commercial districts. Developers and architects are redeveloping older industrial sites and homes and building new modern high-tech residential rentals and condos (Graffiti House | The Nordic | Ispica |10 Halletts Point | 23-09 Broadway | 12-22 Astoria Blvd. | 25-28 30th Drive | 28-57 45th Street | 37-01 37th Street | 13-81 13th Street | 31-09 31st Drive | 21-12 30th Road | 28-06 21st Street | 11-07 Wellington Court etc.). 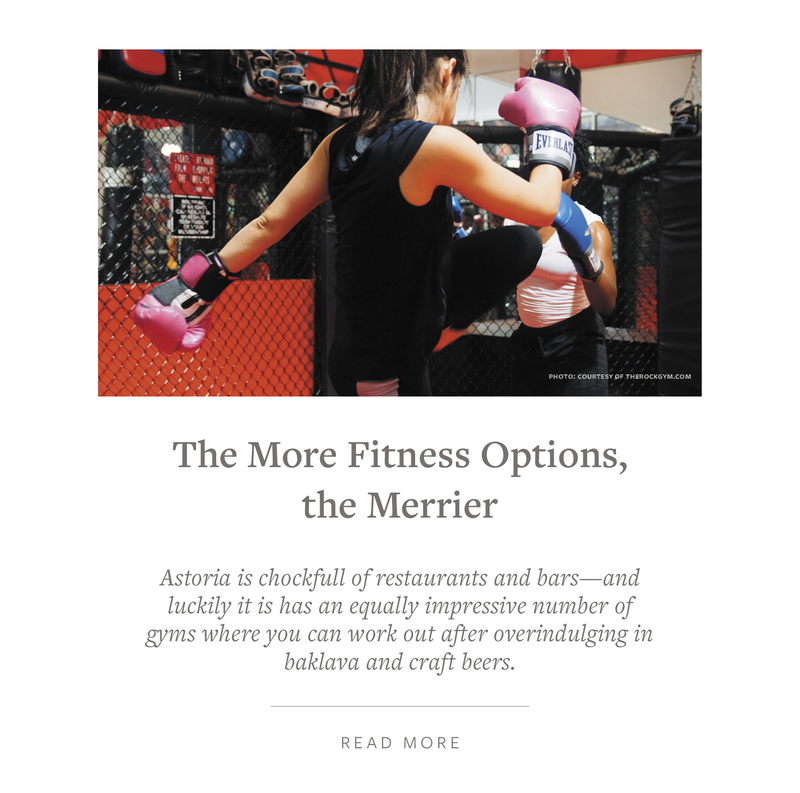 Development includes park improvements, the Hallet’s Point temporary outdoor arts venue, big-box retail shops, restaurants, supermarkets and even a new Astoria Food Hall. On the horizon, as reported in the NYTimes, Mayor Bill de Blasio’s Brooklyn-to-Queens inter-borough streetcar project comprising of twenty-six stops along an 11-mile route running from Gowanus in Brooklyn to Astoria. Under the new timetable, construction on the streetcar, formally known as the Brooklyn-Queens Connector or BQX, will not begin until 2024. In 1839, one of these wealthy men, a fur merchant called Stephen Halsey, the Father of Astoria a fur merchant officially founded the neighborhood and named it Hallett’s Cove. Astoria was a separate village until 1870, when it became part of Long Island City, which in turn was incorporated into New York City 28 years later. 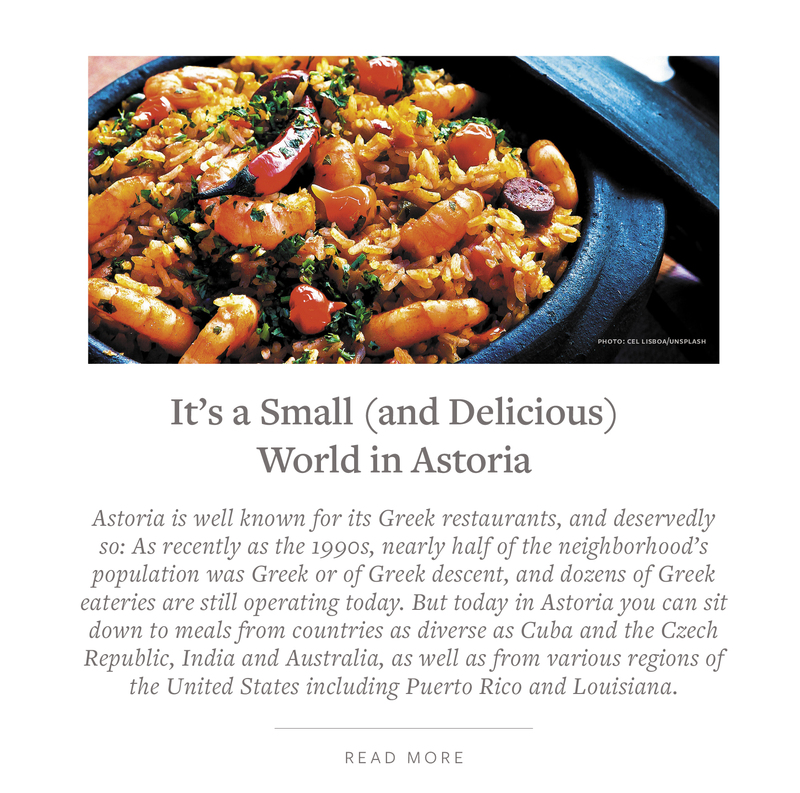 Later, Halsey petitioned to rename the region Astoria after America’s first multi-millionaire, John Jacob Astor, in return for his investment. John Jacob Astor never set foot in Astoria but peered at the village from his Upper East Side Home. Take an excursion along the promenade of Shore Boulevard and Astoria Park and be enveloped by magnificent views of the Hells Gate Bridge, Triborough Bridge (aka Robert F. Kennedy Bridge), Roosevelt Island and Manhattan Midtown skyline. Astoria Park, formerly a Native American site, boasts one of the oldest and largest public swimming pools in the city with a diving pool under construction set to be unveiled next summer. Past locals gathered on Wednesdays to watch the antics of the Aquazanies, a troupe of intrepid swimmers who wore fancy bathing outfits and presented a water show. 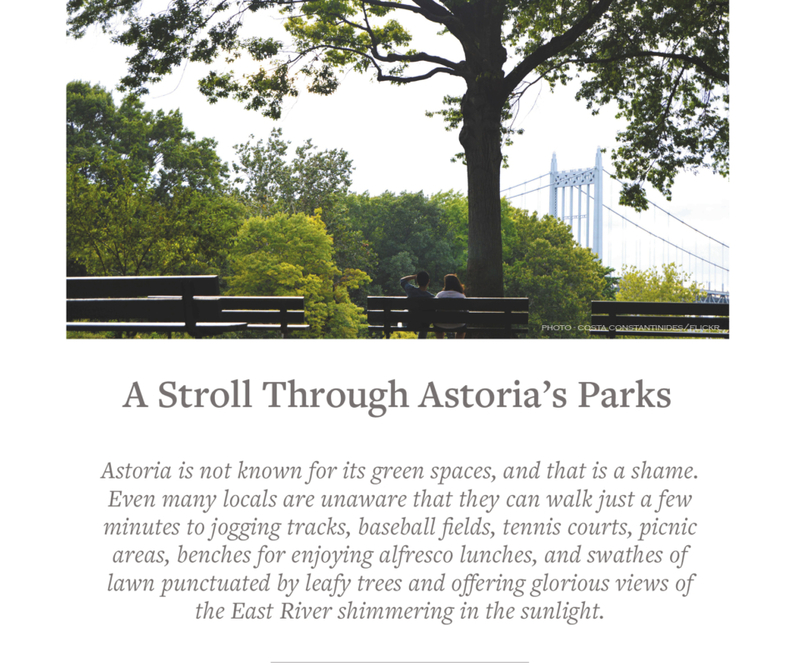 Astoria Park offers visitors hiking trails, events at the bandstand, tennis, basketball and playgrounds. The Steinway Family has deep roots in Astoria since the nineteenth century and brought commercial and economic growth to the area. At that time many German furniture and cabinet makers settled in Astoria including the famous piano maker Heinrich Engelhard Steinweg, patriarch of the Steinway family. For over 160 years, Steinway & Sons has been known for making the finest pianos in the world. They set the uncompromised standard for sound, touch, beauty and investment value. The Steinway family motto for the business and their house was taken from the “Wanderbuch“, German travel book for apprentices who would travel in search of a Master to learn their trade: “He who knows his trade is a Journeyman, A Master is he that invents the plan, an Apprentice is each and every man.” The Steinway’s built a sawmill and foundry, the Steinway Tunnels, a interurban trolley tunnel street-car line in Astoria as well as established Steinway Village for their workers, a company town that provided school instruction in German and English. You can visit the Astoria Steinway factory on Tuesday’s from 9:30 a.m. until Noon from June until September, however, plan your tour in advance – the maximum group is 16 people. Perhaps you have been reading about JDS Development and Property Markets Group reinvented luxurious full amenity Manhattan tower and landmark building peering over Central Park – 111 West 57th Street on billionaire row. The project combines the original landmarked Steinway building designed in 1925 by Warren & Wetmore, and a new terra-cotta and bronze-clad tower addition designed by collaborators SHoP Architects on the adjacent site with interior design by Studio Sofield. 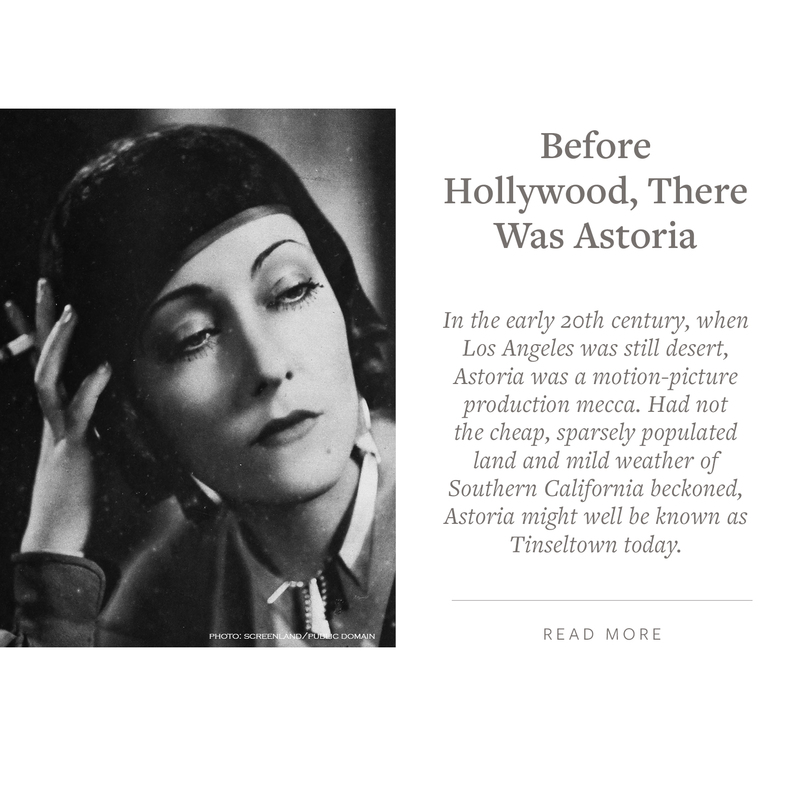 Astoria has played a prominent role in early American film-making, preserved by by the Museum of the Moving Image and Kaufman Astoria Studios. The legendary film mogul Adolph Zuckor, a Hungarian film maker originally opened Astoria Studios in 1920 for the Famous Players Film Company, which evolved into Famous Players-Lasky and then Paramount Pictures and now Kaufman Astoria Studios and produced over 100 Silent Films in its sound stage. Today, the top film, television and digital on-demand series are made at the studio. The studio site has a restaurant and the former Astor Room steeped in Hollywood mystic showcases a jazz venue. New York’s Film Tax Credit Program has made the state one of the most popular spots to shoot in North America. The production incentive, in place through 2022, has created thousands of jobs and added billions of dollars to the New York economy. But being a production hotbed has led to a space crunch. The city’s four major studios—Kaufman Astoria, Silvercup, Steiner and Broadway Stages—are overbooked. Kaufman Astoria Studios’ is beginning a 100,000 square foot campus expansion. Non-qualified facilities, including warehouses, hangars and decommissioned factories are making up for the capacity constraints until other space solutions are derived. Recently, I took a trip to Astoria and rambled down Steinway Street and historically known as Steinway Village to see the first historical landmark of Queens, the Steinway Mansion, built in 1858 atop a one acre hill in the Italianate Villa style. There is commercial expansion of warehouses in the Steinway Village area and Friends of Steinway Mansion are trying to preserve this historic area from the developers. As reported by the Real Deal in June: Silverstein Properties acquired the ground lease on a seven-parcel Astoria Dairy development site in what marks its first major outer-borough expansion. The site stretches two blocks between Steinway Street and 42nd Street in the most southeastern part of the Queens neighborhood. The properties, which stretch across 390,906 square feet on the ground and house the dairy plant owned by Queensboro Farm Products, but carry more than 1.5 million square feet in commercial development rights, according to real estate data service Reonomy. Near the area there is a craft brewery called Single-Cut Beersmiths. They have events and serve up a lite fare of dumplings, buns, nachos, and tacos. They even have these nifty blue glowing phone chargers under the bar. I proceeded to head to Ditmas Blvd to check-out the restaurants and delicious bakeries and to name a few: Boulis Café – 30-15 31s Avenue | Chip Bakery – 30-06 34th Street | Gianpiero Bakery – 4417 30th Avenue | Entenmann’s Bakery Outlet – 4011 34th Avenue | Güllüoglu – 30-92 31st Street | Il Fornaio Bakery Café – 29-14 30th Avenue | La Guli Pastry Shop – 29-15 Ditmas Blvd | Leli’s Bakery & Pastry Shop | Martha’s Country Bakery – 36-21 Ditmars Blvd | Parisi Bakery – 3017 Broadway| Rose & Joe’s Italian Bakery – 2240 31st Street | Yaya’s Bakery – 28-46 31st Street. After dessert, head to the oldest beer garden in New York At Bohemian Hall located 29-19 24th Avenue, a great place to bring large group of friends. For dinner, stroll to Agnanti, directly across Astoria Park on Ditmas Blvd. A charming spot with delicious food. A Greek salad, octopus and bronzino, along with a crisp bottle of white wine make for the perfect Greek meal. After dinner, walk along the promenade and take in the panaromic views. By the Hells Gate Bridge and Ravenswood there is amazing street art. Nearby is the Socrates Sculpure Park by the Hallet’s Cove Ferry Stop. The Ferry ride is $2.75 and worth every penny. The first stop of the high speed ferry is Roosevelt Island, then Long Island City, 34th Street and final stop Wall Street. Watching the light simmer on the water, flights of seagulls, ships of commerce and pleasure brings about a quiet joyfulness. The East River ferries are changing the fabric of the city’s industrial waterfront and commuters similar to the one Walt Whitman took and wrote about in his “Sun-Down” poem are connected to natures rhythms and beauty. Take your own special trip, and if you choose to go this weekend check-out the Annual Astoria Shore Fest celebrating the first day of FALL. Astoria’s Shore Fest 2018 is an event that ushers in Autumn with a fun, free festival in the park! The Astoria Park Alliance event festivities will take place on the Main Lawn adjacent to the Bocce Court off Shore Boulevard with local sponsorship from Ridgewood Savings Bank. The event has intentionally been scheduled for the first day of Autumn to take advantage of comfortable weather that late September offers. Live music will be performed on a main stage procured by The Alliance with a rotating set of local musicians from 1 – 5 pm including The Fogo Azul Drumline, East River Blues Band and more! Shore Fest promises to bring fun for all ages with classic competitions like a watermelon eating contest, potato sack races, egg on a spoon and bean bag toss. Local Astoria retailers have donated generous gift prizes for Shore Fest participants. Shore Fest will also be a place to learn a new skill or hobby like bocce, yoga, zumba, bird watching, and even improv acting. Simply Fit Astoria will be leading live cardio dance demos at 2pm. A Donut eating contest for all ages will be supported by new Astoria donut shop Sugar & Water. Kids will be encouraged to get their faces painted and enjoy assorted arts and crafts activities on the main lawn. Fall has is own special kaleidoscope of colors to behold and special treats to enjoy. Here come the pumpkins, apple cider donuts, and roaring fireplaces. Connect with me this fall via Instagram, my website: www.KarenKostiw.com, Email, the old fashioned telephone or let’s meet in person for a tête-à-tête. Tell me what’s on your mind, and let me know if I can every be of service to you. I am always available to provide real estate guidance, discuss market conditions and trends to you or someone you know. Have a happy Autumn taking in the magic and splendor of this beautiful season.